It’s a new year and new trends emerge. 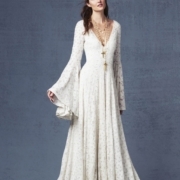 We’re taking a look at some wedding dress trends! Bows! This year we’re seeing the wedding dress trend go towards statement bows. These huge pieces can be used on the back of trains, loops on straps or accents. You could also use the bows on your bridesmaid’s dresses. Bows can also define a waistline or draw attention to areas of your body you’d like more attention to. 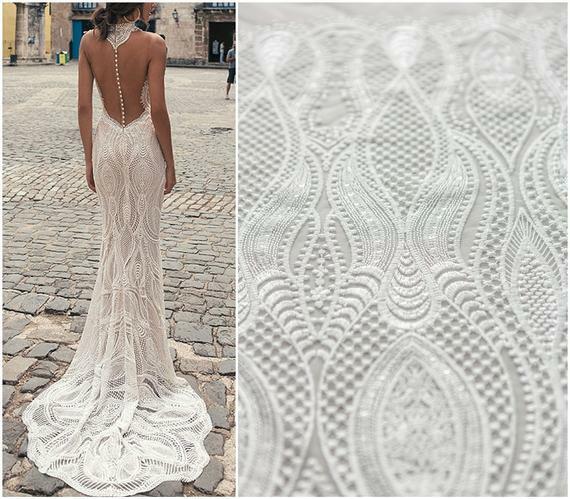 Another trend we’re seeing is geometric shapes on wedding dresses. Shapes and cut out shapes can create a sleek and elegant outline you want. 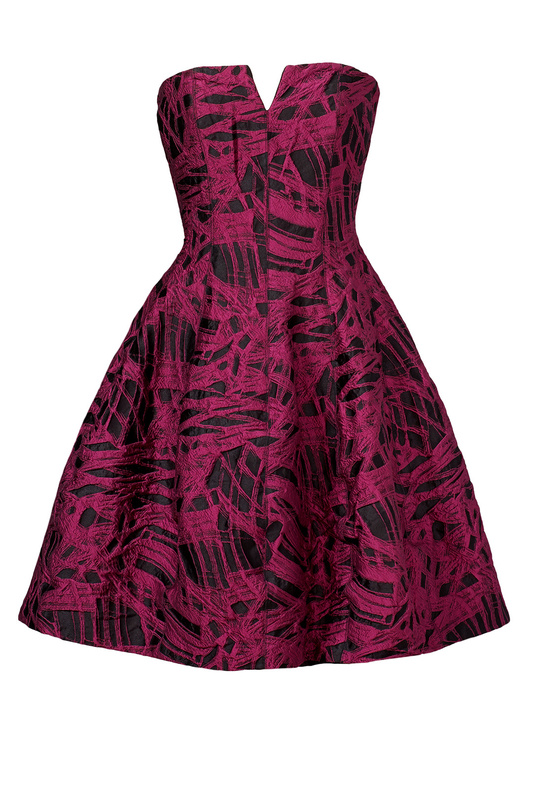 Geometric shapes on dresses are also a great way to draw the eye where you want it go. 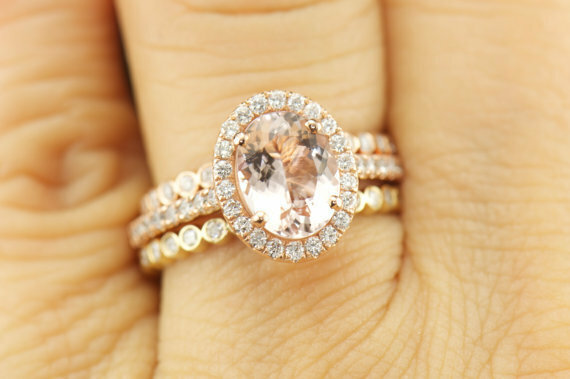 The next trend is very “girly” but if you’re into glitz and sparkle this one is for you! Glitter. This year we’re seeing wedding dresses utilize the sparkly stuff all over and it can literally help you light up the room. Glitter on your wedding dress will catch the light beautifully. If you don’t want an entire dress full of glitter you can just do a light dusting, or have a few places accented with it. 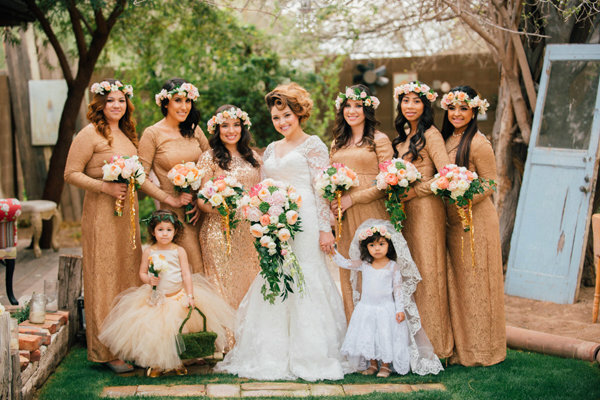 No matter what wedding dress trend you pick, you’re sure to glow on your big day! It’s that time of year again – the autumn wedding! We’re taking a look at what attire to wear to this seasonal event. 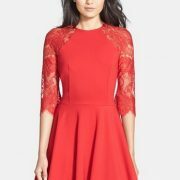 For the daytime autumn wedding, we like a cocktail type dress with darker tones. A daytime wedding usually isn’t as formal as an evening one, but you should still make an effort to appear polished. Jewel tones like burgundy, emerald, sapphire mixed with elegant black are always a classic for autumn. You could even re-use a dress in your closet and spice it up with a new pair of heels or cute jacket. 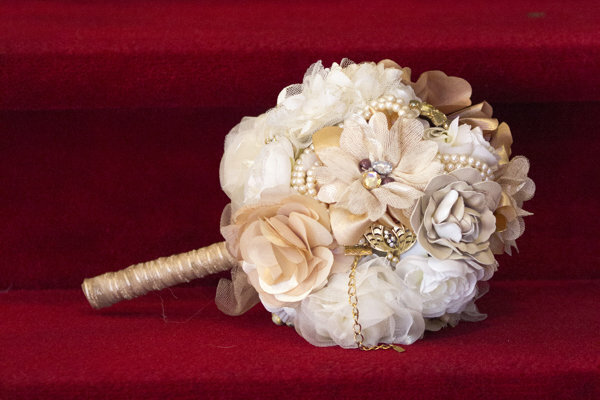 For a later afternoon or evening autumn wedding we suggest simple and elegant. We love a splashy pair of earrings to make a statement or bold necklace. We like looking for dresses than can be dressed up or down. 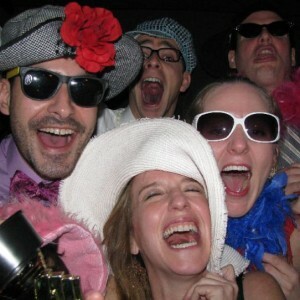 Some people are confused at a later afternoon wedding if they should be more black tie or daytime attire. You can stash a fun jacket and bold earrings in your purse for the evening reception. Think of it like dating – a day to night outfit change without having to completely switch clothes! 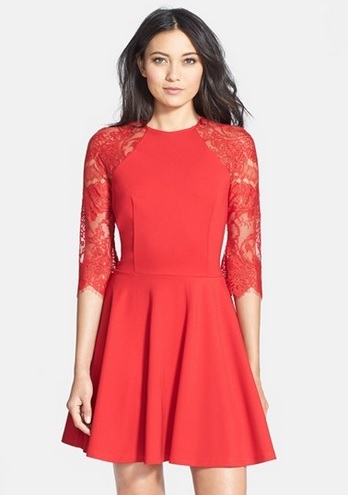 Lastly, we’ve got the festive autumn wedding attire. If your going to a wedding that’s themed and the bride and groom have okayed wacky outfits like costumes, then this is your chance to play! We’ve heard of Halloween themed weddings and as long as your costume is tasteful we love the idea. Even if you don’t want to wear a full on costume, there are plenty of ways to dress up for the occasion. Try a gothic type dress, black lace or high boots! 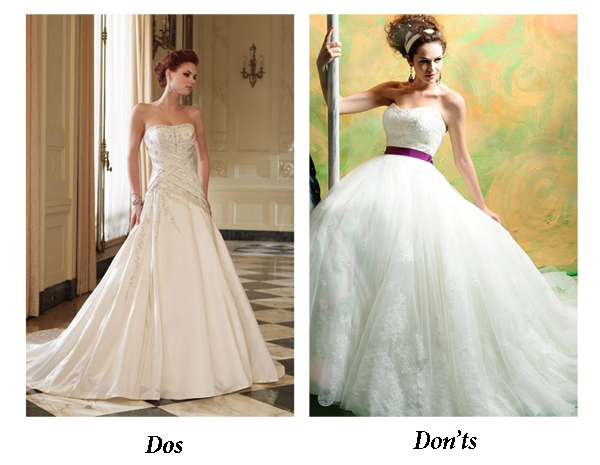 The Do’s and Dont’s of finding your wedding dress can be daunting but we’ve narrowed it down to just a few! You might think you need to rush out and find that perfect dress but hold your horses. This should and can be a fun, exciting and glamorous adventure – not a crazy stressful situation. Do take into consideration your body shape. We all would love to be a model with sky high legs and tiny waist but realistically if you don’t look like that now, you probably won’t on your wedding day. Take some time to really think about what flatters your body type like a well placed ruffle, silk, lace, what color of white or perhaps no white at all. 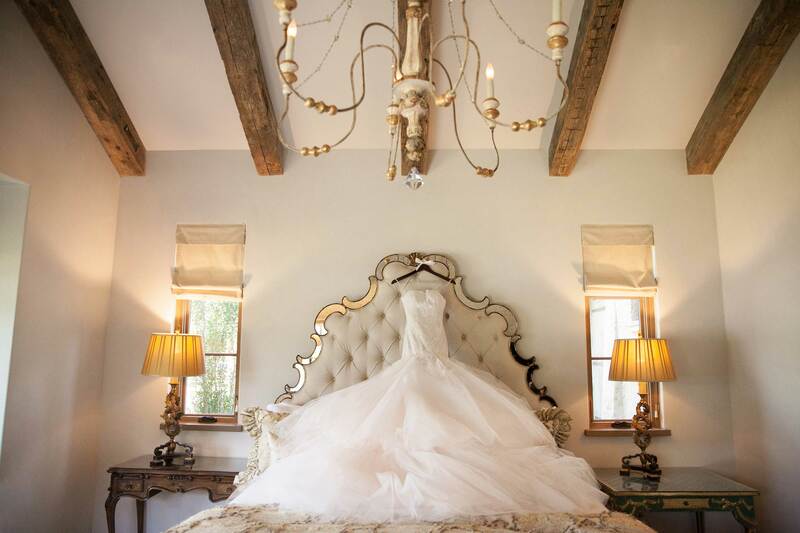 The silhouette of the wedding dress should make you feel comfortable. Do bring your camera or phone to the dress appointment if the boutique allows them. This is because mirrors can’t capture all the angles and you want to look your best on the big day! That big bow on the back of your dress might look great from the side but from behind it might be atrocious. Feel free to call ahead at your planned venue and ask if they will allow a few snaps. Do try on as many dresses you feel the need. This is your wedding day not just a summer picnic. There’s no need to feel rushed or pressured to just try on a few. Dresses look different on the hangers than they will on your body. So, if you need to try on 30 dresses then that’s what it takes! On the other hand, you don’t need to be trying on dresses for “fun” that your cousin thinks are hilariously gaudy. 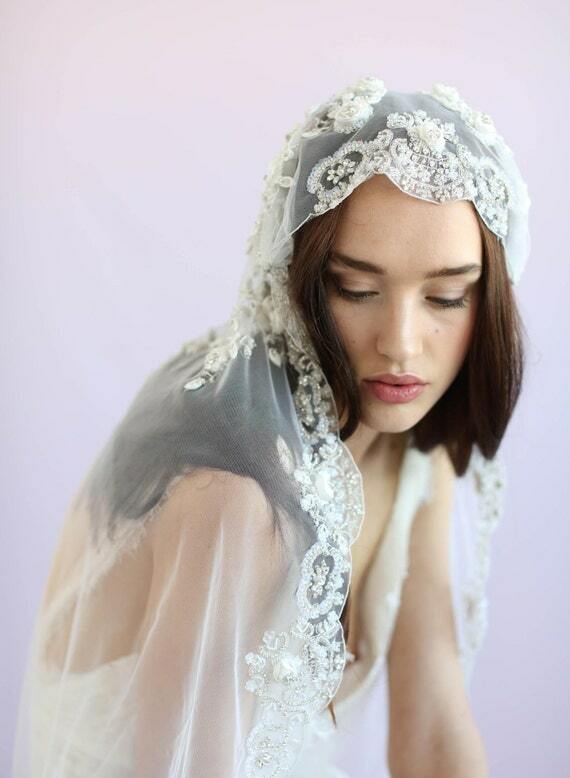 Don’t forget the top of your wedding dress. Many people forget about this and see only the fantastic hemline or giant skirt. 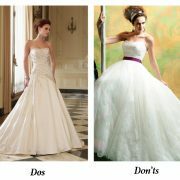 The top of your dress will be in the most photographs so be conscious of what it looks like and what shape it gives you. You can also accessorize the top line of the dress to make it pop even more. Don’t schedule your dress appointment later in the day. The earlier the better! You’ll get fresh staff who haven’t had hours of dealing with picky brides. And, their merchandise won’t be as picked over. You are more likely to get the full attention of staffers and be less rushed earlier in the day. There is no certain weekday or weekend day that’s ideal but a random Tuesday morning versus a Saturday morning might be your best bet! Don’t try on too many dresses. We don’t want to be confusing here but you can suffer from wedding dress overload! It’s tempting to try on just one more to make sure you’ve picked the “right one”. 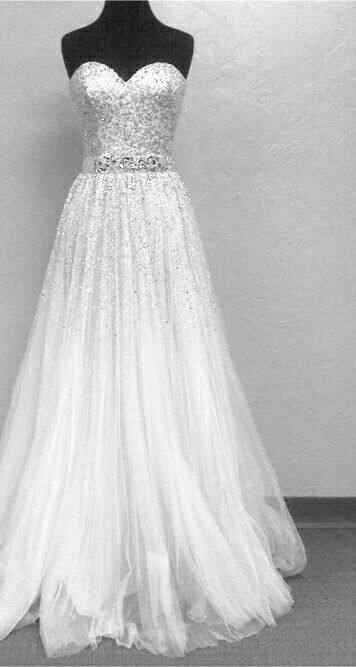 The truth is, most brides find their perfect wedding dress in the first five they try on. They just need to make sure it’s the perfect one. There’s a fine line between picky and indecisive. Hello Brides! We’re sure you are no stranger to the Pinterest wedding trend and we’d love to talk about the hottest ones happening. Pinterest is a great place to get ideas and see what worked for people and what didn’t. We are seeing a lot of off the shoulder wedding dresses. 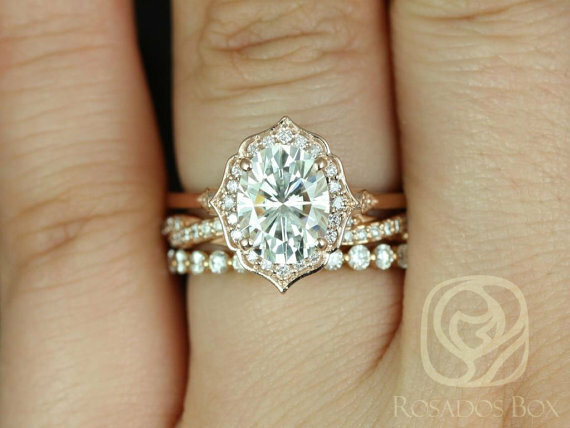 This trend is romantic and a little bohemian! We love the off the shoulder look especially when paired with the other big Pinterest wedding trend: Statement earrings. The off the shoulder neckline leaves your ears and neck bare to be adorned with jewels. 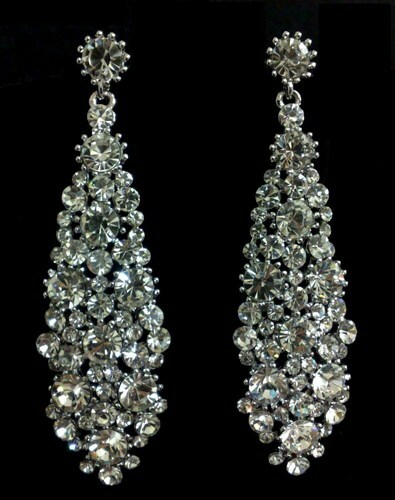 Statement earrings can be anything from dramatic diamonds to long, elegant colored gems. We are loving vintage this season so even better if your earrings have a sentimental value. Necktie earrings elongate the neck and make a great statement. 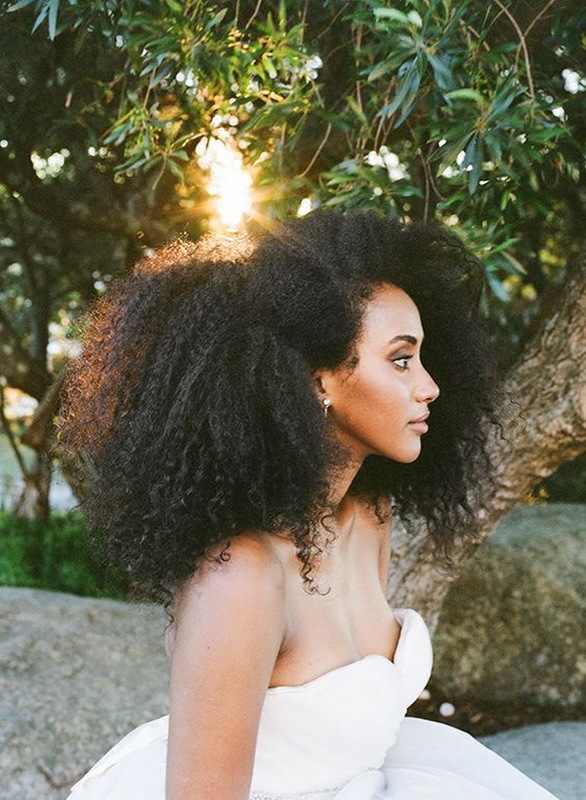 Another Pinterest Wedding trend is natural hair. Brides are deciding to love themselves and their assets! We think going with your natural look is fabulous. Natural doesn’t mean messy or flat. 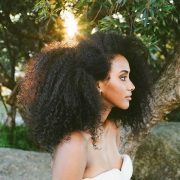 You can have your stylist work with what’s best for your type of hair. If you’ve got a lot of volume then pump it up! If you’ve got thinner hair do beachy waves or accentuate with accessories. No matter what your style Pinterest Wedding trends is a great place to get started! You can find several images and get creative with what you see for your big day! Brides we have something big this year and it’s the removable skirt! 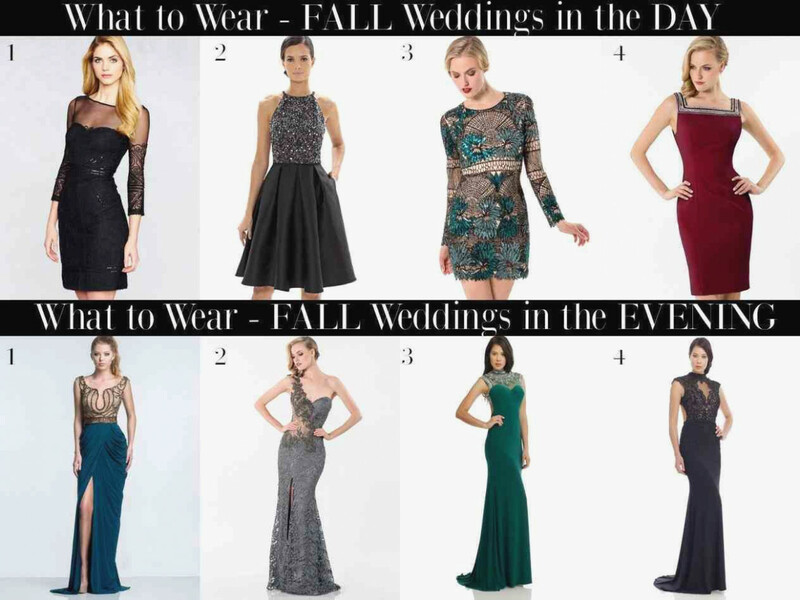 Are you torn between the huge ball gown and the sleek sheath? Well, now you can possibly have both. It used to be that only celebrities wore two dresses on the big day – one for the ceremony and one for reception. It’s become much more affordable and why shouldn’t you celebrate like a star? We love that the tulle removable skirt turns a dramatic ball gown into a beautiful sleek dress. Plus, you won’t have the fee for a entirely new second dress. A removable skirt can give you the freedom to dance more at the reception. Or it may be you just don’t want to carry around the extra weight of a giant ball gown when you want to be moving around. This A line princess tulle wedding dress has the removable skirt to turn it into a tea length stunner. Layers of tulle make the dress light and romantic. It also makes it easy to pull off for the second dress underneath! We love that you can be fun and versatile with the second dress. 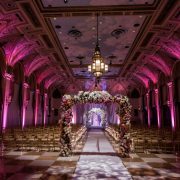 For your reception you can utilize the second dress as a part of a big entrance. Why not stun the guests and wow them with a completely alternate look? 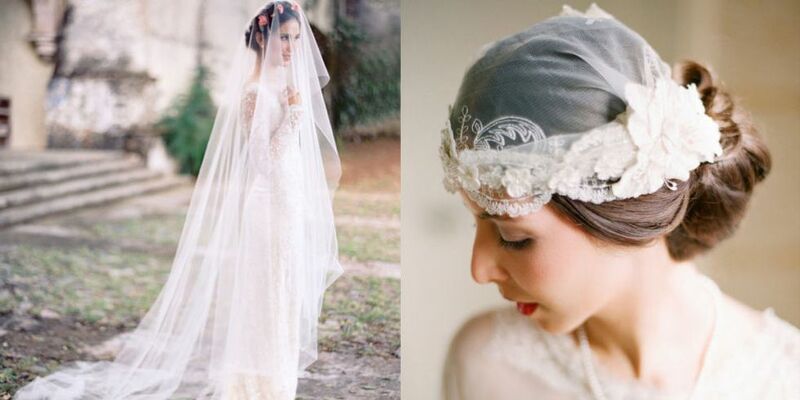 You could add a hat, shorter veil or shimmery accessory to give your second look some fun! 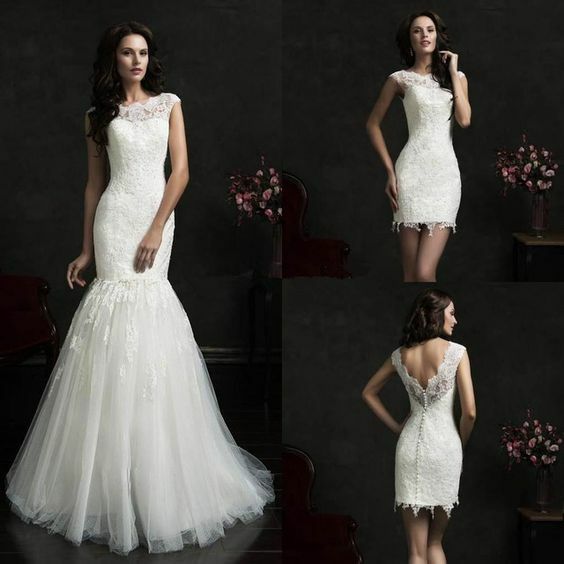 You also do not need to give up the shape and style of your formal wedding gown. The removable skirt can come with many shapes and styles of regular dresses. If you’d like a mermaid shape no problem! You can also custom make your double dress But, a lot of retailers are familiar with the removable skirt and will be happy to show you samples. 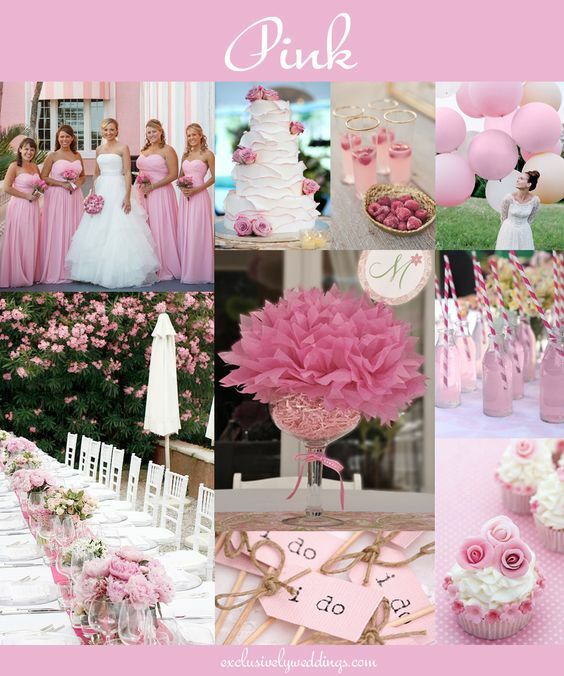 For the Love of Pink is our theme this week. Welcome to Spring brides! This amazing shade is timeless and romantic and there are a hundred ways to use it. Even if pink isn’t your favorite color it can still add that touch of softness or femininity. 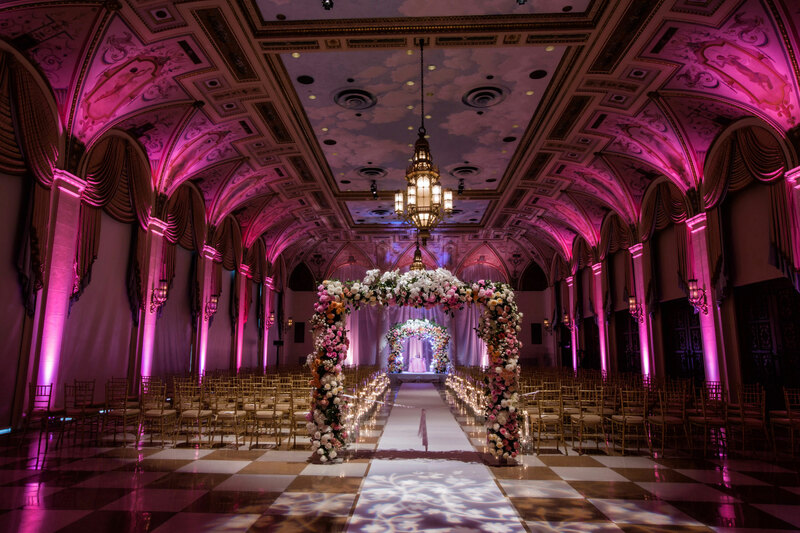 Of course, you don’t want a venue that looks like Pepto Bismal threw up in but pink has it’s uses. One way you can use the color is for flowers naturally. There are varieties of pink flowers available no matter the season! Whether on your cake, in your bouquet, your bridesmaid’s bouquets or as table decor. A second way to use pink is for your bridesmaids! Hopefully your girls love this color and to give them some choice maybe you can let them decide what shade of pink they like best. You can have them choose from a deep pink to a blushing light pink. You can also let them pick what shape/style dress. They can be all the same length such as tea length or floor. But, you can allow them to pick straps or scalloped top, etc. 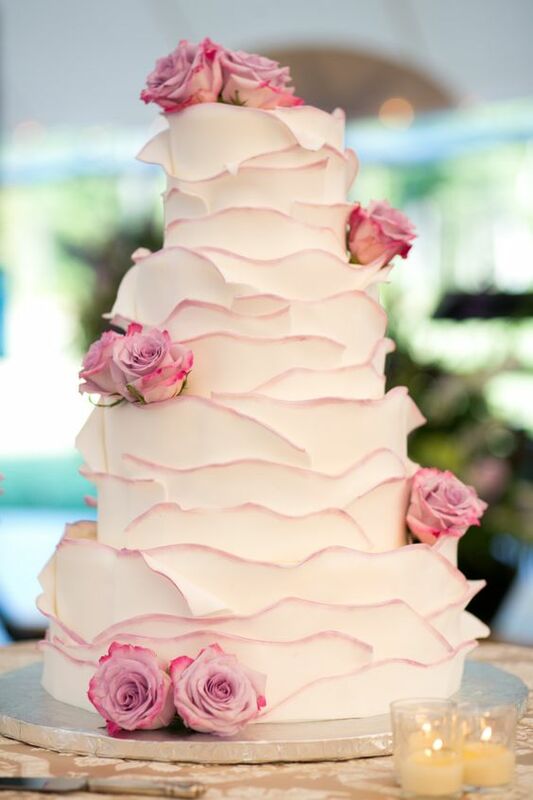 A final way we love using pink is the accents! Colored lights, invitations, place cards or curly script on banners is all fun. You can have the floor lighting or DJ lighting turn up the pink lights. 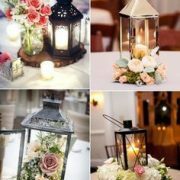 They can glitter and glow all over the reception venue to make it a romantic, sparkling room. 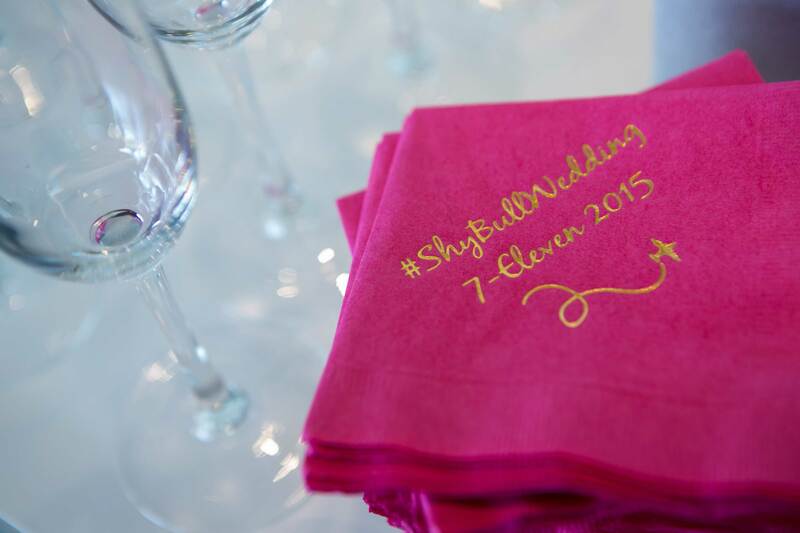 We love pink napkins too! You can emboss and personalize them with your initials or even the bridal parties. Any way you use pink it’s a great color with many shades to make your day spectacular!